Last year's #1 overall pick Sam Bradford was a huge rookie success. Will our GMs be so lucky? The first ever SKOHRboard & Stangs League NFL Mock Draft kicks off right now! As I said yesterday, we have 5 highly qualified NFL experts who have each been assigned the role of temporary GM for several NFL teams and we will go through the first two rounds selecting the best players for our respective teams. While you follow along, I'd like to urge you to give us your feedback and please feel free to lobby for your respective team to pick whatever player you feel is best suited to them. As the GM of the Panthers, I realize I have a lot of core needs in order to improve the franchise. If given the option to trade down and gain multiple picks, I would more than likely pull the trigger. However, it does not seem that any franchise is attempting to move up, so I am forced to pick the player who will help this team the most. 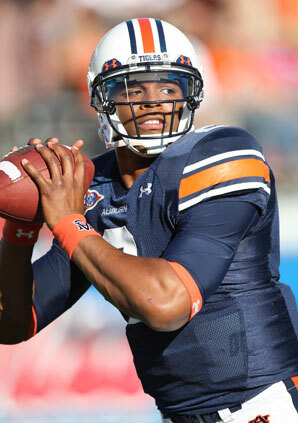 And that player is QB Cam Newton from Auburn. I am hesitant on this pick because I believe Newton is more of a project than an immediately ready QB and have given Patrick Peterson very high consideration as well. Nevertheless, the #1 pick has to transcend the franchise and Cam Newton has more upside than anyone in this draft. With such a rare skill set of height, speed, mobility and arm strength, Newton has the ability to set the NFL ablaze if taught how to play the QB position correctly. Newton dominated the best competition in college football last season, and the hope would be that he’d do the same in the NFL. However, I am skeptical of Newton once he gets his big paycheck (like Jamarcus Russell) , he will not want to work as hard to become the best at his position. In order to be a successful QB, you have to watch hours of video and analyze yourself along with opposing defense. While watching Newton in college, he did not seem to grasp how to read defenses and instead relied heavily on his athletic ability to make big plays in big situations. 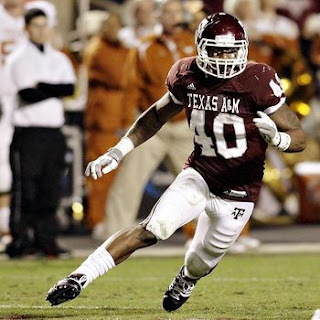 In the NFL, this will not be the case, as defenses are much more athletic than the SEC. Also, his accuracy has come in to question as he is moving many times when he makes his throws down field. Like Mike Vick, who has recently improved on his accuracy with Philadelphia, Cam will have to work on being a better pocket passer. There is no player in the draft that has Cam’s upside, and that is the reason he is picked here (along with selling tickets), but having 3 QB’s in Claussen, Pike and now Newton in the past 2 drafts is a lot of dedication to improving one position. I think Newton reminds me most of Daunte Culpepper, a big, strong, fast QB with a cannon arm, but suffered a big injury that sidelined his career and was never able to get back to his prime young days in Minnesota. I'm not saying Newton will get hurt in Carolina, but Newton reminds me of Culpepper and can see his career suffering the same fate. The Denver Broncos would absolutely love to trade this pick to one of the more DT-needy squads. They have a lot of holes to fill in this draft after the Josh McDaniels reign of terror. Some of the holes, such as running back, just don't make sense at this position. What does make sense is drafting the best overall player and that just so happens to fill a MAJOR need for a team. While Patrick Peterson would fill a major hole at CB, we just couldn't pass up a major talent like Marcel Dareus to shore up the defensive line. Dareus is a legitimate five-technique defensive lineman, capable of moving to the outside in the 3-4 and back inside in the 4-3. The Broncos have to love that, because John Fox has already stated that he is changing the defensive scheme to a 4-3. Fox also said that while they will be committing to the 4-3 defense, they will occassionally be a multi-front defense that utilizes the 3-4 like the team did under McDaniels. Moving to the 4-3 will allow the Broncos to move Elvis Dumervil and Robert Ayers (and maybe even Mario Haggan) back to their natural defensive end positions where they can keep their hands on the ground and not worry about anything but getting to the quarterback. Additionally, on top of being a 5-technique defensive lineman, Dareus is capable of being a two-gap defensive tackle when he is inside. This will be especially important when the speedy but undersized defensive ends are on the field. This selection was only between Dareus and Peterson; Nick Fairley had only one year of solid play and several instances of dirty play, and we don't need that in Denver. The Buffalo Bills have consistently been the worst drafting team year in and year out for the last 10 years. They constantly reach for players based on need with no regard for talent and it has showed on the field. They did the complete opposite last year drafting CJ Spiller at #9 when they already had 2 very good RBs on the roster. This year the Bills have the #3 pick and a number of positions that need addressing, with QB being the most glaring of them all. They need a face for the franchise and more times than not that means a QB. The problem with this year’s class is that there are no clear cut sure fire studs at QB. There aren’t even any top-flight offensive tackles to fall back on. With Cam Newton off the board and Gabbert’s stock falling, I think this year the Bills get it right and take OLB Von Miller. He might be the most explosive pass rusher to come out in years. With 33 career sacks at Texas Tech, he could be a force on the field for a team that is in desperate need of one. Demarcus Ware and Clay Mathews have shown the league how much of an impact a great pass rusher can have on a defense and Miller is in the same mold. His upside is just too high for even a notoriously poor drafting team like the Bills to pass up. Though the management of the once-proud Bengals would love to start stocking up on players that could help protect our quarterback or help rush theirs, the elephant in the room is the unpleasant situation with Carson Palmer. If we really want to be serious in this division and this league, we have to field a quarterback that can at least reach the same skill-level as Roethlisberger and Flacco. While it is likely that we will be bad enough to make a play for Luck next year, we have to find someone new to build upon. That being said, neither Mallett nor Gabbert strikes us as someone we want to use as a foundation. We can stand to pick the next best QB with our 35th pick (Dalton or Kaepernik? ), so the real question is: edge rusher, pass blocker, or wide receiver? None of the top OL or DEs (Pouncey and Bowers) reach the value that we have at this pick, so we will have to find talent at those positions later on. 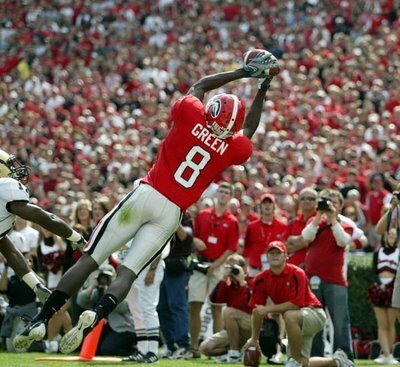 At receiver, we have our choice between the two best receivers in the draft- AJ Green and Julio Jones. Both are stellar athletes and could change the way we pass the ball. As a general manager, I want to pick the best guy that fits our system, not who the scouts say is the best. We hired Gruden to run a West Coast offense, and Julio Jones has the edge there. Both of these guys are three year starters with National accollades. Green could easily be the better of the two, but we might need some... you know what, the more I try to rationalize it, the more I realize that Green is the guy we want. He has been a star in the SEC for some time, and he is physical enough to block on the line, run across the middle, or go deep down the field. I know we will run that West Coast, but you don't want to be the team that passed up the next Calvin Johnson, which is what Green has a good chance of becoming. In the end, Jones' inconsistency with the ball and his issues of self-control (a culture we are putting an END to in Cincinnati) outweigh his physical play at the line and his fit into the system. Let's just get a passing TE later on to catch those balls in the middle. The Cardinals could go in a number of ways with this pick, but the biggest weakness in their team is clearly QB. 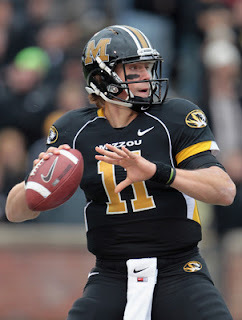 The good news is that Gabbert might have the most pro potential of any QB in this years draft class. The bad news is that he is going to take some time to reach that potential because he comes from a shotgun spread offense. Having WR Larry Fitzgerald to throw to will certainly help him but as we saw with the Cards last year, you can't have just anyone throwing the football in his vicinity to make the offense work. Gabbert has a lot of promise and could very likely turn into a great pro QB, however he won't be one in September. The Cards will also have to pick up a veteran for at least this season to both help Gabbert's progression and lead the team through the 2011 season. Arizona will probably also take a hard look at CB Patrick Peterson but the ability to upgrade QB with a potential franchise player is too great an opportunity to turn down. This is a big slide for Peterson who is my pick for first choice overall if the Panthers don't take Newton. Stay tuned because we will be rolling out 4-5 new picks every day until the NFL Draft begins on April 28th, just two weeks from today! #7 San Francisco - Justin!